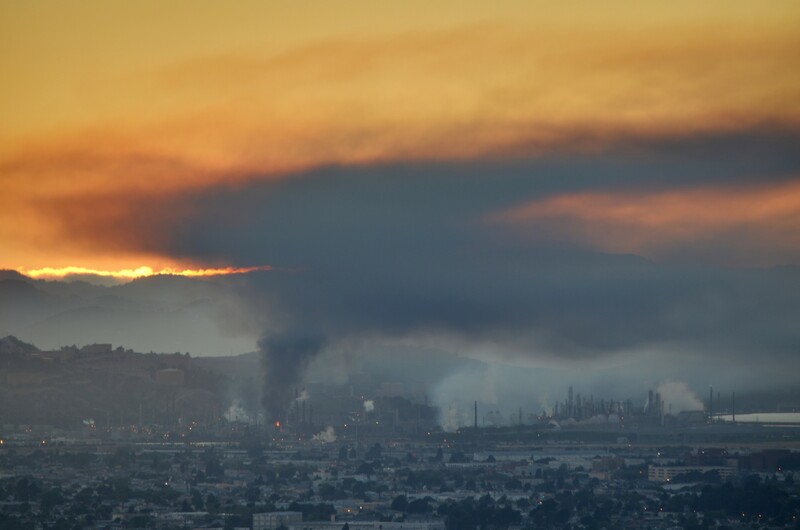 The federal Chemical Safety Board on Wednesday issued the final installment of its stinging indictment of Chevron for the huge fire on August 6, 2012 at its Richmond refinery. The fireball spread a cloud of toxic smoke over Richmond and prompted 15,000 residents to seek medical treatment. The basic outline of the CSB’s account of the incident had been laid out in previous reports and in a animated video. The final report, presented to the Richmond City Council on January 28, detailed technical and management failures that led to the fire. The CSB story of the fire starts with the fact that many of the pipes in the Chevron refinery are decades old and made of a kind of steel that is especially vulnerable to erosion. Meanwhile the amount of sulfur in the crude oil processed in the refinery has continued to increase. Sulfur is the main element that corrodes the pipes. In this accident-waiting-to-happen scenario, management rejected or ignored many reports that conditions were unsafe and requests for safer equipment and practices. When a leak appeared in one of the pipes on August 6, 2012, Chevron managers did not understand the cause of the leak and took actions that increased the risk. Instead of immediately shutting down the operation, they tried to stop the leak while oil that had heated to more than 600 degrees continued to flow through the pipe. Soon the pipe broke, releasing a huge cloud of toxic fumes that shortly ignited into a fireball. Amazingly, no workers were killed. The final CSB report included a technical explanation of why the material in the pipes was extremely vulnerable to corrosion and recommended constructing equipment with “inherently safer design,” rather than continuing to patch corroding pipes. It reviewed a number of specific occasions before the fire when Chevron management had decided against recommendations by professional staff and refinery workers for more thorough inspections, changes in equipment, and other safety measures. The report also criticized Chevron’s “safety culture,” noting that management “encourages continued operation of a unit despite hazardous leaks.” Theoretically workers have “stop-work authority,” the right to stop an operation if they feel it’s unsafe, but surveys showed they were reluctant to exercise that right. Richmond City Manager Bill Lindsey reported that the city and Contra Costa County, following the CBS’s earlier recommendations, have revised their Industrial Safety Ordinances and are in the process of forming a joint committee including representatives of labor, management, and the public, to oversee safety at the Chevron refinery. Contra Costa Hazardous Materials Officer Randy Sawyer added that city and county officials have been working with Chevron, and the refinery has been conducting inspections of all its piping. Clyde Trombettas, a district manager at the California Occupational Safety and Health Administration, reported that the state also has been making changes recommended by the CSB, including new safety regulations for refineries, increased staff for enforcement, and more rigorous and frequent inspection of all California’s refineries. B K White, president of United Steelworkers Local 5, which represents workers at the plant, said, however, that Chevron “still doesn’t fully support workers’ ‘stop-work authority.’” When workers try to use that right, he said, “They [managers] try and talk you out of it or give you excuses or just override it.” In its current contract negotiations with the refinery, the union is trying to strengthen that right and increase safety training for workers, he said. Several other speakers commented that greater power for workers in the refinery is key to making plant run safety. Communities for a Better Environment, which has a long track record of fighting Chevron on safety issues, last year issued a certificate of recognition to the Chemical Safety Board for its reports. CBE senior scientist Greg Karras, while praising the report’s findings and recommendations, urged the board to amend its recommendations to put more emphasis on the need to monitor the quality of crude oil being refined as well as the materials used in refinery equipment.